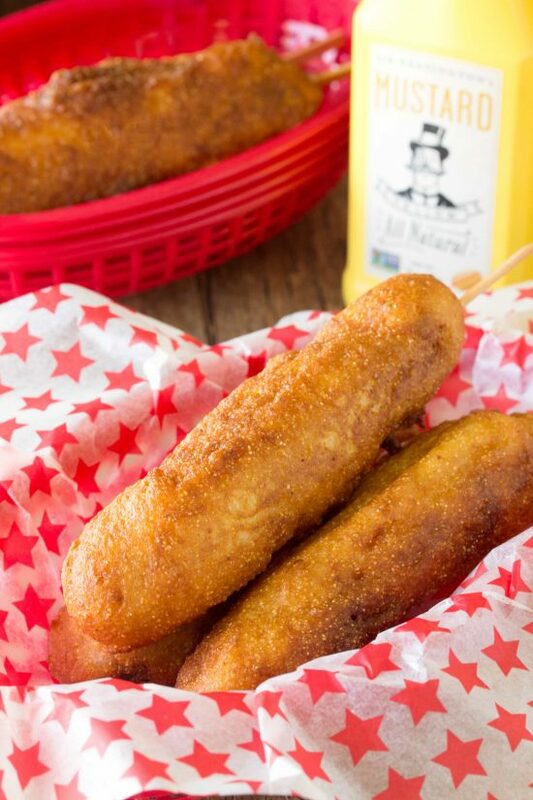 These Disneyland-Style Hand Dipped Corn Dogs are covered with a thick cornbread coating and fried to golden brown perfection. It’s just like they make them on Main Street at Disneyland’s Little Red Wagon. There’s nothing like chowing down on a corn dog at Disneyland while you wait for the parade. I don’t like hot dogs. Shoot, I don’t even really like corn dogs. But the ones at Disneyland? Why, they are amazing! There’s just nothing like a hand dipped corn dog. We had annual passes to Disneyland for 2 years and lived just 45 minutes away. I may have gone every week (or more!). One of our favorite things to do was to watch the parade. And with The Little Red Wagon right next to our favorite parade watching spot….well, we always grabbed one while we waited. I have so many fond memories sitting on the curb near the Little Red Wagon, my family at my side, each of us scarfing down a hand dipped corn dog. Where do I find the sticks? I found the sticks in the craft section at Walmart. They were just called “craft sticks.” They are thinner than popsicle sticks and work much better. Popsicle sticks are too wide and end up taking up too much of the hot dog. They are quite clumsy. One corn dog can be pretty filling. Guess what? It’s super easy to freeze what you don’t eat right away. Reheat in the oven on a baking sheet at 400 degrees for about 10-12 minutes. They will crisp up and still be pretty tasty. There’s nothing quite like fresh, but homemade frozen corn dogs are way better than store bought. PRO TIP: Lots of people have suggested pouring your batter into a tall glass for easy dipping. I don’t find this any easier than dipping into a bowl, but it definitely makes for some fun! 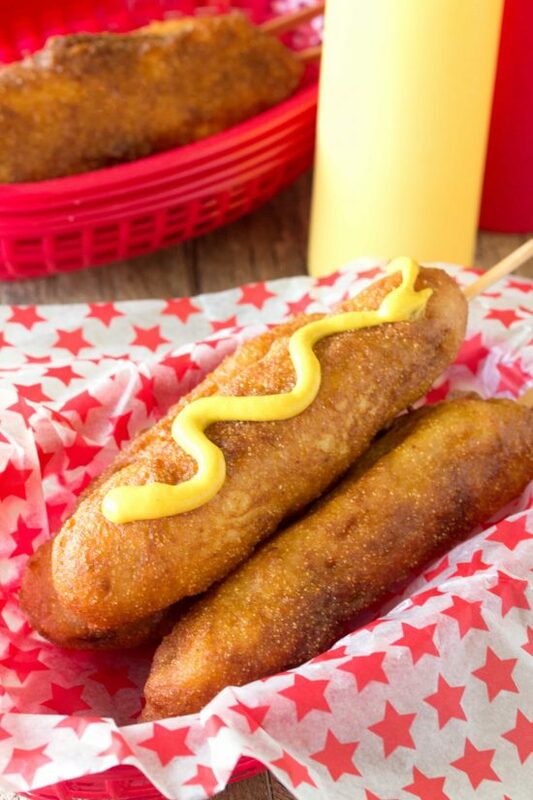 Get the kids in on this action in the kitchen and get them dipping their own corn dogs! Just make sure they stay away from the hot oil. Head on over to YouTube where you can watch my cooking show episode where I demonstrate these corn dogs. Or you can check out the short version below. Heat your vegetable oil in a large pot to 350 degrees. In a mixing bowl, stir together the cornmeal, flour, sugar, baking powder, and salt. Use a whisk to beat in the egg, milk, and vegetable oil. Insert the popsicle or craft sticks into each hot dog leaving enough of the stick showing to create a handle. Pat each hot dog dry with a paper towel. Dip each hot dog into the batter, covering the hot dog all the way up to where the stick is inserted. I found it best to use my fingers or a spoon to spread out a nice thick coat of the batter (because the corn part of the dog is my favorite!). After dipping put immediately into the hot oil to fry. Each one only takes 3-4 minutes. Fry each dog until golden brown. Put on paper towels to drain. Don’t have buttermilk? Try a buttermilk substitute. This recipe was originally published on The Stay At Home Chef on June 10, 2013. There is absolutely no honey in this recipe…. How can you call it “Honey Dipped Corn Dogs”? It’s called a HAND dipped corn dog. It looks like your hot dogs in the video are pre-cooked..is this right? 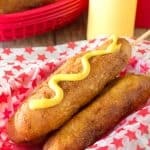 I could never get the batter to stick to the dogs but I am going to try this I LOVE CORN DOGS. They are just hot dogs straight from the package. Tried these tonight and they were very good. My 7 year old daughter loved them and she is s super picky eater! I have self rising corn meal. Should I omit baking powder? It may or may not work. I don’t know how much baking powder is in your corn meal already. Can I use plain milk instead of buttermilk? What is the difference? So is it 1 cup of buttermilk or 1 1/4 cup ???? 1 to 1 1/4 cup. It really depends on how accurately you measure your flour and cornmeal. Cups really aren’t the most accurate measurement so it causes a bit of a variation. I made these and was actually surprised at how good they were. Fast and easy, my type of meal. These turned out fantastic. They were crispier than others that we have made. I would try a dusting the hotdogs in flower prior to calling them in the future. Thanks for sharing.